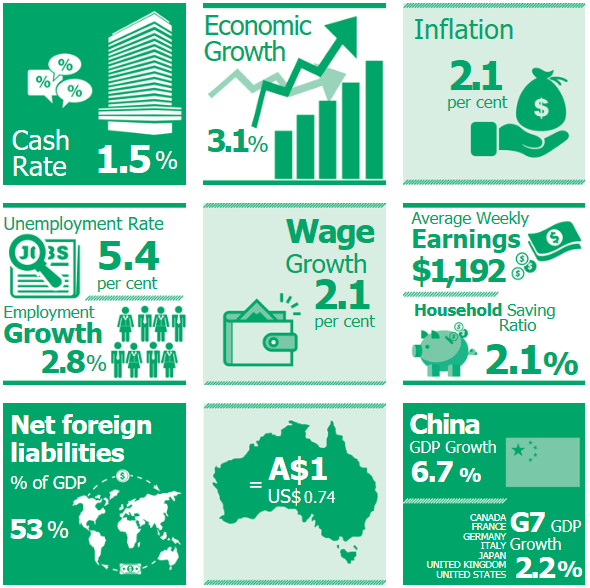 Wednesday 8th August – Australian Market Wrap | Beeks Downunder-Because not all financial news is boring! ASX 200 up 15 to 6268 as rally peters out . Results dominate. High 6279 Low 6257. Narrow range. CBA pleases but NAB in RC spotlight. Big miners rally on Asian commodity rises. Healthcare and staples do better. Aussie Gold steady at $1634. ECX 10.56 brokers stick with buy recommendations. DMP -1.46% UK franchise results disappoint. LYC +4.63% rallying after presentation. AMP +3.88% audible sign of relief. BLA -8.40% sellers back in charge. FLT -1.33% losing altitude ahead of results. Big run though. TAH +7.56% good results and synergies. GOR +3.03% bouncing off the bottom. NAN +1.54% launches trophon2 in North American and Europe. BWX -8.67% profit result date postponed and guidance. GXL -3.70% still a dog. AMC -2.50% still suffering after Bemis bid. BAL -2.92% becoming a substantial holder. A2M -2.29% AU8 enters the market. GNC -0.13% potenial global grain shortage. Speculative stock of the day: G Medical Innovations (GMV) +45.95% on big volume following an announcement on an IPO of its Chinese subsidiary on HKSE. Biggest risers – CVN. ECX, TAH, LYC, AMP and IGO. Biggest fallers – BWX, IFN, WBA, SIG, MMS and SIQ. Commonwealth Bank (CBA) +2.63% FY18 report. Cash earnings from continuing operations, including one-off costs were down 4.8% to $9.23bn, however, underlying cash NPAT was up 3.7% to $10.01bn. Return on equity was down 160bps to 14.1%, the CET1 Capital ration was flat at 10.1%, earnings per share were down 6.2% on year to 528.6c, and the full year dividend is +2c to 431c per share. It looks like a bit of a miss as the results were impacted largely by the $700m AUSTRAC civil penalty and regulatory costs, however, the increased dividend is a positive. AMP (AMP) +3.88% 1H report. Underlying profit was down 7.1% to $495m whilst net profit was down 74% on year to $115m hit by advice remediation revisions. An interim dividend of 10c per share was announced with 50% franking, and the full-year dividend will be within the guidance range but at the lower end. AMP highlighted going forward, FY18 cost guidance will be achieved, and the main focus for 2H will be restoring customer faith in the business. Sandfire Resources (SFR) +0.13% Talisman Mining has signed off on the acquisition of its subsidiary, Talisman A, who owns the other 30% stake in the Springfield Joint Venture, by SFR. BWX (BWX) –8.67% Has changed its FY18 results release date from the 15th of August to the 29thof August. They also announced that preliminary underlying EBITDA will be up between 52%-55% on last year to between $40m-$41m. SkyCity Entertainment (SKC) +2.48% FY18 results. Normalised net profit NZ$169.5m, +10.4% on last year, attributed to an increase in ‘high-rollers’ visiting their casinos. Normalised Revenue +7.3% to NZ$1,096.8m, lifted by NZ performance +3.2%. SKC’s Australian revenue was down 0.2% when reported in AUD, however, has been lifted to +2.4% by an appreciated AUD against the NZD since the last reporting period. Earnings +5.5%, but expected to fall slightly due to a higher effective tax rate. A final dividend of NZ$0.10 was reported. Current dividend policy will be maintained. Trading YTD in line with expectations, with modest growth anticipated. Tabcorp (TAH) +7.56% FY18 Results. Revenue +71% to $3.8bn whilst net profit came in at $28.7m, up from a $20.8m loss pcp. EBITDA +69.5% to $3.8bn and earnings per share up to 1.9c after a 2.5c loss per share pcp. The exit of Sun Bets, Luxbet closure (both loss-making businesses) and the merger with Tatts impacted results through a significant items expense after tax of $217.5m. A fully franked final dividend of 10c per share announced. Tabcorp will focus on managing integration and sustainable growth initiatives across its businesses in FY19 and feel they are well placed to adapt to a number of reforms recently introduced in the gambling sector. Medical Developments International (MVP) –1.49% Has completed a $17m capital raising, issuing 4,250,000 shares at 400c and will now open up its share purchase plan (SPP) to existing shareholders to purchase between $500-$15,000 worth of shares at 400c. The SSP is capped at a total issue of 1,250,000 shares representing 30% of MVP. Carnarvon Petroleum (CVN) +29.99 Latest wireline results confirm more light oil in the Crespin and Milne Members. Drilling has added another 40 metres of net oil pay, taking total hydrocarbon net pay now to 132 metres in the Dorado-1 well. Investa Office (IOF) –0.19% FY18 results. NPAT was up 10.6% to $521.6m and NTA was up 14.2% to 507c per share, both driven by valuation gains predominantly in Sydney markets. Funds From Operations (FFO) grew 0.8% to $184.0m or in cents per unit terms, grew by 3% to 30.6c. FFO FY19 guidance is for a 4.6% decrease on year to 29.2c per unit due to the refurbishment and subsequent vacancy of Wellington Street and Kent Street properties next year. FY19 distributions are expected to be unchanged at 20.3c per unit. RBA governor Lowe speaks at conference. Slow rise in wages. Gradual infaltiuon rate rise and next move in rates will be up but on hold for some time. ‘Gradual’ is the watch word if things continue at the current pace. 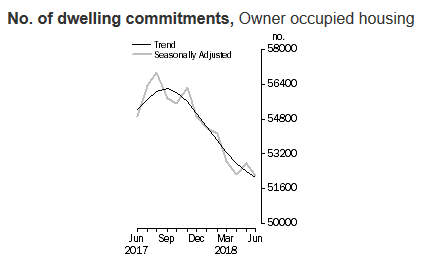 The trend estimate for the total value of dwelling finance commitments excluding alterations and additions fell 0.7%. Owner occupied housing commitments fell 0.2% and investment housing commitments fell 1.8%. 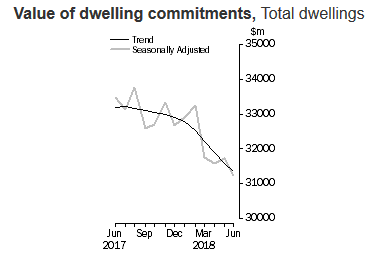 In seasonally adjusted terms, the total value of dwelling finance commitments excluding alterations and additions fell 1.6%. Chinese exports grew at a faster pace than forecast in July. Cathay Pacific slumps to a HK$263m loss for the last six months. Reminibi steady as trade wars heats up. China Tower Corporation opened flat on listing in Hong Kong, reflecting muted investor interest in the world’s largest flotation since 2016. 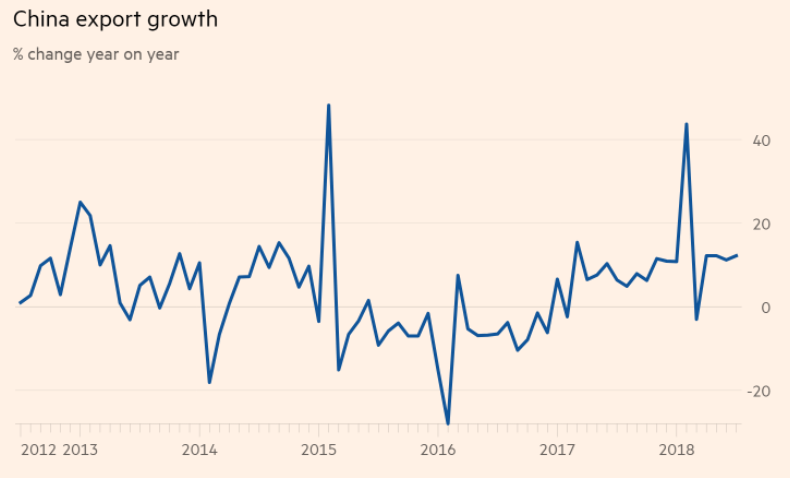 US back on the trade warpath with another $16bn of goods to be hit with tariffs. Customs will begin collecting the duties on 279 product lines, down from 284 items on the initial list, from August 23, the US Trade Representative’s Office said .The new list covers products ranging from motorcycles to steam turbines and railway cars. The GOP is leading in the Ohio district elections but only by a razor thin margin. Bad news fro GOP which was expected to romp home.